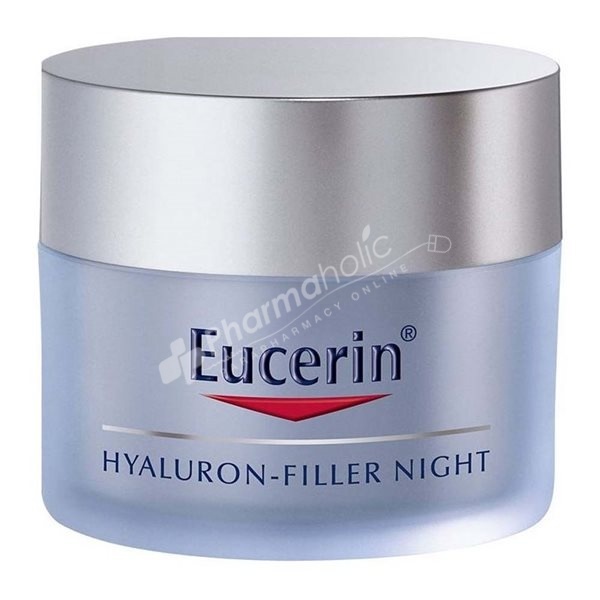 Eucerin Anti-Age Hyaluron-Filler Night Cream is an advanced formula night cream to target and plump up the appearance of even the deepest wrinkles. Its formula contains two different types of Hyaluronic Acid to target all wrinkle types plus bio-active Glycine-saponin, to actively support the skin's own Hyaluronic acid. Concentrated Dexpanthenol supports the skin's own overnight regeneration process. Skin feels soft and well cared for. Apply Eucerin Anti-Age Hyaluron-Filler Night Cream in the evening onto well-cleansed face, neck and décolleté(chest), avoiding the delicate eye area. Aqua, Glycerin, Butyrospermum Parkii Butter, Isopropyl Palmitate, Panthenol, Caprylic/Capric Triglyceride, Hydrogenated Coco-Glycerides, Octyldodecanol, Butylene Glycol, Glyceryl Stearate Citrate, Stearyl Alcohol, Cetyl Alcohol, Dimethicone, Glycine Soja Germ Extract, Tocopherol, Methyl Methacrylate Crosspolymer, Acrylates/C10-30 Alkyl Acrylate Crosspolymer, Sodium Carbomer, Caprylyl Glycol, Trisodium EDTA, Phenoxyethanol, Methylparaben, Propylparaben, Parfum (Fragrance). Active Ingredients: Acide Hyaluronique, Saponine.